Hurricane Maria caused billions of dollars in damages to Puerto Rico and left 3.4 million island residents without electric power, potable water, and telecommunications. Recovery is estimated to take years. In response to this disastrous event, the Center for Puerto Rican Studies (Centro) and the University of Puerto Rico’s School of Planning, in partnership with other educational institutions and civic organizations throughout the diaspora and Puerto Rico, launched the Rebuild Puerto Rico Initiative. 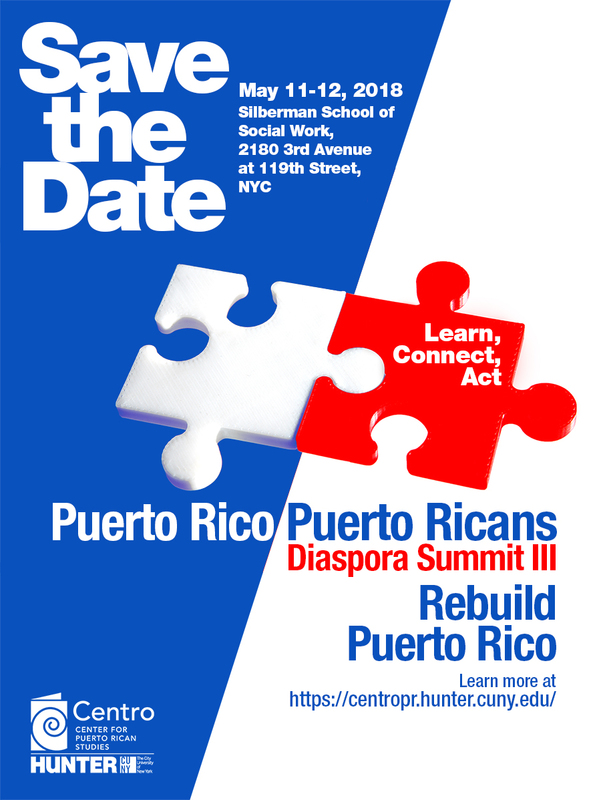 Puerto Rico, Puerto Ricans Diaspora Summit III - Rebuild Puerto Rico seeks to facilitate the connections and collaborations of Puerto Rico’s civic sector and Puerto Ricans in the Diaspora who want to join efforts to contribute to the rebuilding of Puerto Rico. The Resiliencia y Solidaridad: Encuentro con la Diáspora Conference to be held in San Juan, Puerto Rico in June 15 2018, will serve as a follow-up to the Puerto Rico, Puerto Ricans Diaspora Summit III. Both conferences are components of the Rebuild Puerto Rico Initiative. Diaspora Summit III Action Fair, Saturday, May 12, from 10:00 AM to 12:00 PM. The Center for Puerto Rican Studies will hold its 3rd annual Action Fair during the Puerto Rico/Puerto Ricans Diaspora Summit III, on Saturday, May 12, 2018 from 10:00 AM to 12:00 PM. This fair is a diaspora networking and community-building event. Meet and greet community leaders from around the country and exchange ideas for affecting social change for our people.